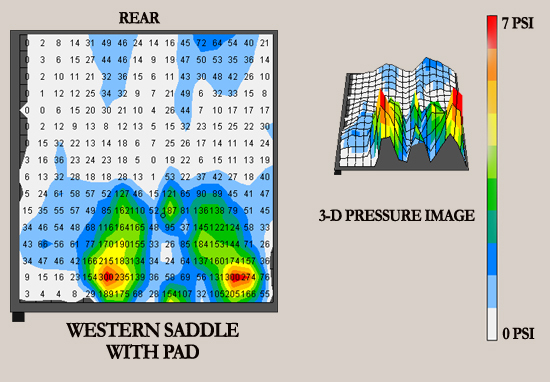 The traditional western saddle often is too tight due to substantial padding. The tradition of using both a blanket and pad, combined with the popularity of today’s thicker pads, often creates bridging. Complicating the issue is the use of bulky, thick leather, double-thick skirting encasing the tree, and extending two to three inches in front of the bars of the tree. This often pinches the shoulders and interferes with the tree fitting in the manner it was designed to. 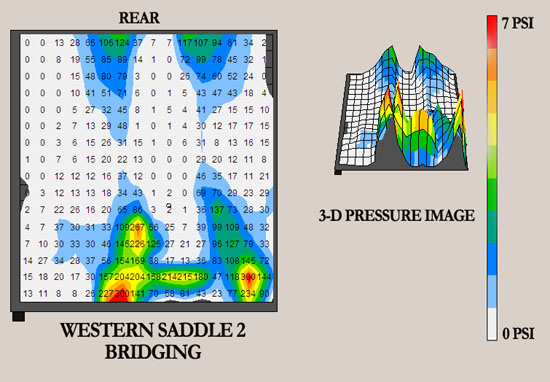 TW Saddles have eliminated this unnecessary leather in front of bars and shortened bars slightly so shoulder movement isn’t as compromised as on most other western saddles For more on the effect of padding and how it affects saddle fit see “The Pad Paradox” article by clicking here. Evaluating saddle fit on a fleece-lined western saddle is difficult. 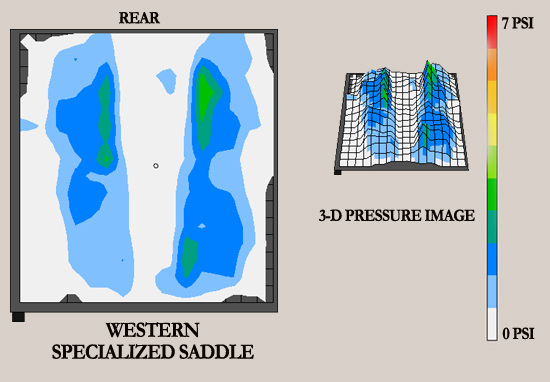 As a result of saddle either being too narrow or too much padding, all pressure is on withers/shoulders. This failure of saddle to fit properly results in it being lifted off back, in center, and some remaining pressure is on loins where contact resumes. This condition is referred to as “bridging”, like a bridge spanning a gully, resting only on the front and back. Horses experiencing this will be reluctant to extend their gaits and this much pressure will cause pain, tissue damage and associated white hairs. Here (below) is an image of same weight rider in a TW Saddle. Note even, light pressure spread evenly along the bars with slightly higher pressure under rider’s seat.